Hello FM Friends, can anyone help me to put Japan League with the players active? I put the file in editor data folder but the players still grey. The FM database does not include any players contracted to Japanese clubs, for licensing reasons. As a result, activating the Japanese league will mean that the clubs are still empty, apart from the odd player loaned from abroad. In order to have Japanese players in your game, you would need to download a separate editor data file containing a Japanese player database. I find this file to be the best one, but there are others in the FM scene. You can run this file alongside claassen's Japanese league file, in order to have both the league as playable and also real players. Hope this helps. Thaks Man only the club information do not appear in the game. But there is no problem i think. I'm goingo do to a season with Kashima to see if there are some type of problems. For now it is working very well. The club information for Japanese clubs is also hard-coded not to appear for licensing purposes, and as far as I know nothing can be done about it. Hello, how to play the CFA and CFA 2 at the beginning of the career? Hello! Please note that in Paraguay managers don't get sacked, it doesn't matter if they lose all the matches of the tournament they will always remain in the club. Any solution? - New 2017 format for Philippines league and Zanzibar league and cup. In preparation: Australia NPL and USA NASL & USL. Thus, all countries of the original game will have minimum 1st and 2nd division activated. You should remove Kuwait Federation Cup, it hasn't existed for two years. - Others leagues activated: Finland 3rd div., Iceland 3rd & 4th div., Russia 3rd div., Ukraine 3rd div. is it possible to activate/create the German Oberliga? 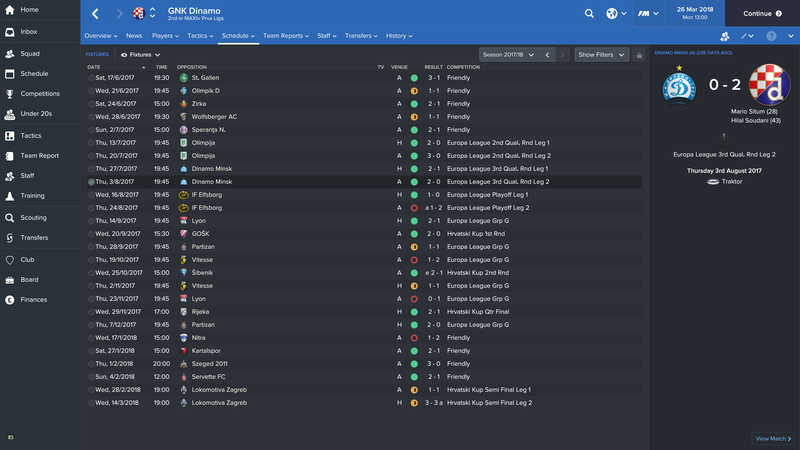 Why Kosovo teams cant take part in champions and europa league after 1st season? It's not possible for Kosovo teams, it's hardcoded by Sigames. I added Iceland league Cup 2 for Iceland , updated Taiwan league with 2017 format (apertura and clausura stage then final between the 2 stages winners) and put real relegations for Finland and Ukraine 3rd divisions. - 18 lower European leagues activated! : Austria 3rd & 4th div., Belarus 3rd div., Bulgaria 3rd div., Croatia 3rd div., Czech Republic 3rd & 4th div., Greece 3rd div., Hungary 3rd div., Israel 3rd & 4th div., Poland 3rd div., Romania 3rd div., Serbia 3rd div., Slovenia 3rd div., Switzerland 3rd, 4th & 5th div. 2022 (before World Cup): only three days vacation (22 to 24May) - my team was knocked down Rock Cup. was fixed it in last update? How do I use these? Do I have to open them through the editor and activate them there? Is this the final update for this pack? I'm getting an error when I load the USA file. It's saying 9 teams are loaded for NASL instead of 8. Would you know how to fix? I've got a problem with the Croatian leagues. After the first season, none of the Croatian leagues have any league fixtures scheduled, they only play in the cup and in Europe. @leotavo Gibraltar update is the only one update that I did not personally make . It's the official update of SIgames, so..
@taringakos I modified a little thing for this in the update but I don't think it could come from the update but may be from the note of chairmans.. To check..
@Grifffin Taylor No, no plans for other release. I just added in more the 5th (and last) division for Israel (for my personal game ) with the cups for Level4 and Level5 which are qualifying for the Israel State Cup. (winners and finalist for Level4 cups and winner for Level5 cups). I rebuilded the Israel State Cup , like in the reality. @draykid I don't have this problem. So, I think other files that you have downloaded in editor data that is conflicting with my files. Hello, wanted You to make some adjustments regarding Lithuanian A league. You can register up to 30 players for season at a time and everything is good in the game with that, but there must be some changes made. 1. There can not be more than 6 non-EU players in the whole squad. Europeans from other countries can be registered, but at least 4 domestic players older than 20 must be registered. 2. In this update You can not register more than 6 foreigners (even within EU) for match squad but in real life You can register the whole squad out of forigners if You want. @Aivaras Butkus thanks for the information, it's fixed. hello, can i play this addon with the winter update ?17.3.0? I have a problem with a few countries like Thailand or Indian 2nd division. The file is fine with the 17.3 database but it's not working with the default database. For example, for the Indian 2nd division i need 12 teams but there are only 11 teams.